We've been hearing a lot about Ash dieback recently - the disease that's spread from the continent and could wipe out most of the ash trees in the East Anglian countryside. More than a hundred thousand trees have already been destroyed - and it's a wood that's used in everything from specialist sports cars to holding up church bells. So what effect is this disease having? Kate Prout has been investigating. Watch her report. Scientists, conservationists and politicians will be meeting in London today to discuss the spread of Ash die-back disease. 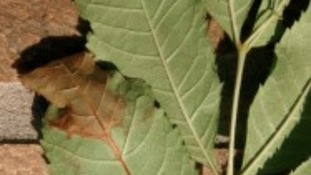 The number of reported cases of ash dieback seems to increase daily. For many it will trigger memories of another deadly disease that all but wiped out the UK's elm tree population. Dutch Elm disease arrived on our shores in the late 1960s and went on to kill nearly 90% of elms. There's evidence that the deadly ash disease has spread to Essex. The infected trees are the first found in the wild outside Norfolk and Suffolk. There are now more than 80 sites where the disease has been confirmed. One nursery owner has said he'll have to destroy his crop of 500 ash trees, even though there's no evidence of them being affected.